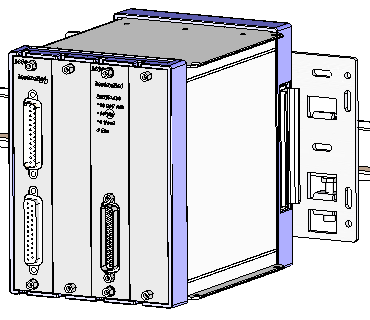 The i530 package enables one to attach a 4, 8, 12, or 16 slot i4xx Card Cage to a 35mm DIN rail or to a flat wall. 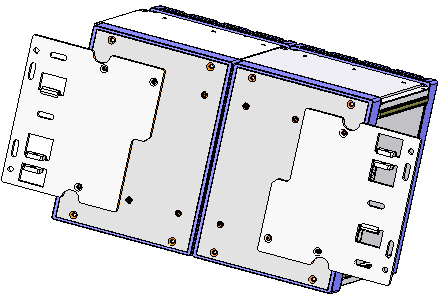 The i530 packaged includes two i4xx DIN Rail Mounting Brackets and eight 4-40 flat head 0.250" bolts that can affix the brackets to pre-thread holes in the i4xx Card Cage back, bottom or top. The #iNet-530 package includes 2 brackets and eight 4-40 flat head 0.250" bolts, as pictured below. 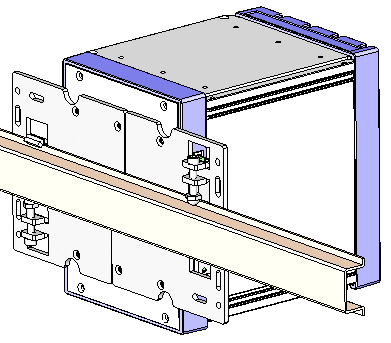 If the brackets are mounted with the DIN Rail clip facing outward, then they are used to attach the card cage to a DIN rail. Alternatively, one can mount the brackets with the DIN clips facing toward the card cage, and then use the bracket to attach the card cage to a wall. This is helpful if you do not have access to both sides of the wall. On the other hand, if you do have access to both sides of the wall, then consider bolting the i40x directly to the wall without brackets, as described here. The i530 brackets support card cages of any width. The illustration below shows how the brackets attach to the outter areas of a card cage that is larger than 4 slots, for example. To install the i530 brackets; bolt them to the top, bottom or back of an i4xx Card Cage using 4-40 flat head 0.250" bolts included with the i530 package. If one is affixing to a DIN rail, then 8-32 bolts on the bracket are used to grip the DIN. 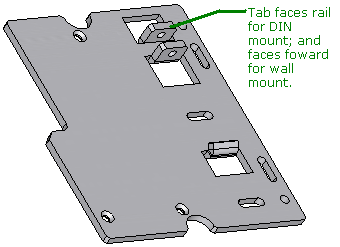 If the 8-32 DIN tabs are directed outwards, then the brackets are used to attach to a DIN rail. Alternatively, one can position these tabs inward and then use the bracket to affix the card cage to a flat wall. The illustration below shows the 4-40 bolts and the 8-32 DIN tab. 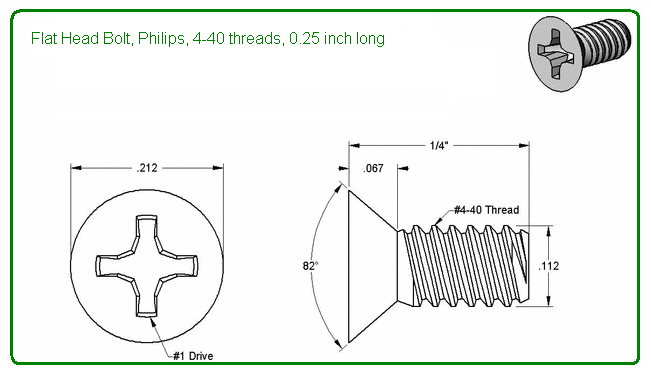 Eight 4-40 flat head bolts are included with the i530 package, yet one typically only uses six. One can easily mount the i4xx Card Cage into a 19" Rack by bolting the bottom surface of the card cage to a rack shelf. These shelves are available from 3rd parties. For information on how to drill your shelf with holes that mate with the i40x, click here. 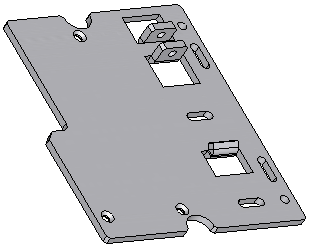 For a mechanical drawing of the i530 bracket, click here.